From 25 tons to 350 tons, we have you covered. We are an industry leader and have been for decades. 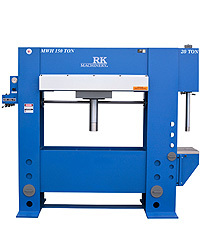 At RK Machinery, we take enormous pride in our reputation for producing the finest hydraulic presses in North America. We understand that in a machine shop, variety is the only constant. To stay competitive, you need the ability to tackle any job that comes in the door, big or little. Like the gentleman pictured to the right, holding a 40-lb. cylinder, sitting on a 4,000-lb. cylinder, we know that your shop needs to handle the widest possible scope of jobs. That’s why machine shops look to us for hydraulic presses that are versatile and easily adaptable to the needs of a wide range of projects. We know that all machining starts with the press operator, which is why our presses are designed with the operator in mind. His comfort and safety are the top priority. Each of our presses is made with the highest quality, industry-standard parts. All of this means less downtime, greater efficiency, reliability and durability. 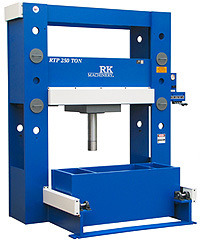 Here at RK Machinery, we produce a comprehensive line of hydraulic presses, made for the needs of busy machine shops. Instead of adapting your jobs to the press, you can choose the press that meets the requirements of your jobs. 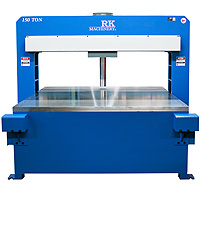 Check out our entire line and select the press that meets your specific demands. Here is an overview of our wide range of models and capacities. 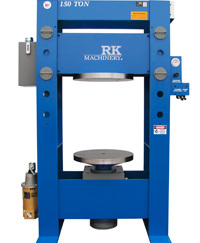 At RK Machinery, we have the H Frame press you’re looking for. Whether it is 25 tons, 350 tons, or a capacity in between, our H Frames feature a low-pressure hydraulic system. This helps to keep oil at a steady, lower temperature, with the result that our presses are efficient, safe, reliable and long lasting. They come standard with open sides, making it easy for your operators to work on long pieces. Our presses are highly adaptable due to the flat ram nose that is easy to change. With their quality Baidor motors and low-speed pumps, they presses are dependable, which means reduced downtime. They are designed with a self-locking table, double-acting cylinder, hydraulic power-lift and large oil reservoir. Our innovative H Frame/Broach press line can make your life simpler. Available in 50-ton, 100-ton, 150-ton and 250-ton models, it extends the capabilities of an H Frame press with a 12-ton or 20-ton broaching press. With its powered movable workhead for off-center work, this press combo makes it easy for the operator to position the cylinder with just a touch of a lever. This 2-in-1 combination saves floor space and adds greater functionality to your machine shop. This combo costs less than investing in two separate presses, saving you money. 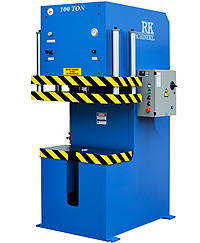 Our Roll-In Table press is built around a stationary frame with a movable roll-in table. Made for heavy-duty jobs, it has four-axis control. 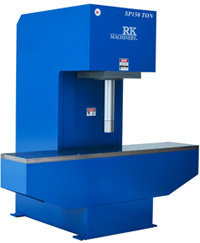 It is powerful, accurate and efficient, the workhorse in any machine shops. As always with our presses, ease of use is built-in. 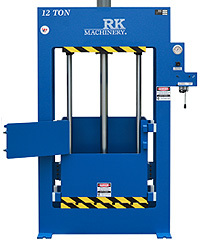 Our line of C Frame presses has a range of size, including 25-, 50-, 75- and 100- and 150-ton models. Each press features dual controls, making it easy for operators to choose either of two modes. They can use the movable pedestal, which has a dual electric palm button and additional emergency stop. Or they can choose to operate it with the foot pedal. All of our C Frame presses come standard with pressure regulators and gauges, making it simple to limit the ram pressure. The stroke control is adjustable and it comes with both a distance reversal switch and pressure reversal switch. It is easy for operators to adjust the ram pressing speed using the adjustable speed controls. We make these C Frame presses easy to use, with jog mode for simple setups and the ability to remove the standard U-slot table for another one. Each has a high quality Baldor motor, PLC programmable control system, and an industrial oil cooler that is air-cooled. Our lines of straightening presses can handle a wide range of materials, including aluminum, copper alloy, titanium, stainless steel and steel, steel alloy and carbon steel. Operators appreciate the fact that we build them for comfort, with a pedestal that is easily adjustable for height. The result is less physical stress for workers and fewer accidents and injuries. The machine is straightforward to operate, ensuring that both experienced and beginner operators can handle it. We include features that come standard on all models, including low oil temperatures, low pressure for the hydraulic system, fingertip control, adaptable flat ram nose, Baldor motor, smooth and consistent pressing, large oil reservoir, low-speed pump, and a pressure regulator. We designed our line of hydraulic forklift tire presses with the needs of the operator in mind. Each press has easy cylinder activation, providing the operator more control. Ram movement speeds up the more the lever is engaged. Our forklift tire press comes standard with a large cylinder rod for platen stability and long seal life. It has a regulator to limit the ram pressure and a double-acting cylinder that allows both pressing and return. It has a large oil reservoir and hydraulic power-lift for vertical displacement of the head assembly. Because it maintains lower oil temperatures, the press is efficient, safe and durable. We make a Gantry Straightening press that can be used on a wide range of materials, including nickel alloys, steels, steel alloys, carbon steels, stainless steels, aluminum, cast iron, copper alloys and titanium. A real workhorse, it is reliable and versatile, which improves workflow and efficiency. The press is flexible, at home on post-production adjustments on axels, shafts or rods, as well as fabricating a variety of metalworking projects. Called the workingman’s press, it is designed for operator comfort and ease of use. We built it with a moveable workhead, letting the operator place the cylinder from side-to-side and front-to-back with just the touch of a lever. Standard features include a regulator that limits the ram pressure, an adaptable flat ram nose and low system pressures which result in lower oil temperatures. As a leader in hydraulic presses, we take pride in producing specialty hydraulic presses custom made for the specific needs of your machine shop. From design process through manufacturing, you are consulted each step of the way. 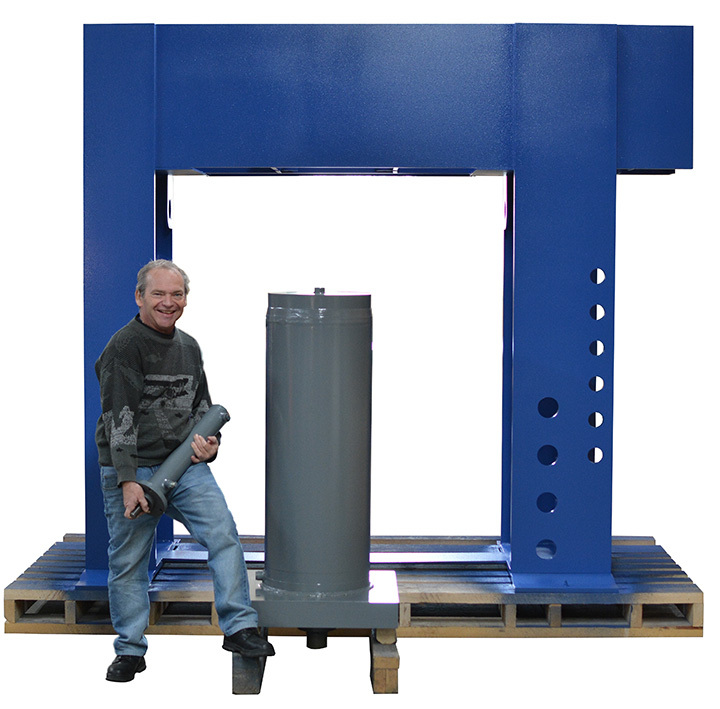 Our goal is to give you a custom-built hydraulic press that meets your exact needs. 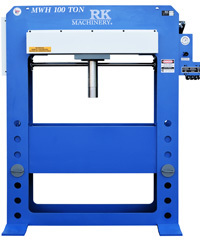 Your shop specifications are designed into your customized hydraulic press. What you ask for is what you get. Made in North America, your press is manufactured using the highest quality methods and industry-standard parts. Whatever your needs, from a 12-ton vertical baler to a 350-ton heavy-duty press for industry, we at RK Machinery can handle it. Copyright © 2012-2017, RK Machinery. All rights reserved.